To be a true hero, you need training! You need nerves of steel! You need some really sick martial arts movies! You need a gravely voice! But most importantly, you need a cool cape and a mask. Just look at all of the greats of the DC universe. Superman wears a cape. Batman wears a cape. It's a superhero rite of passage. And the mask? Well, not everyone can fool the entire world with pair of glasses, so sometimes a mask is necessary to hide their secret identity. Of course, if you're planning on initiating your child into the wide world of stopping bad guys, then he's going to need a cape and a mask. 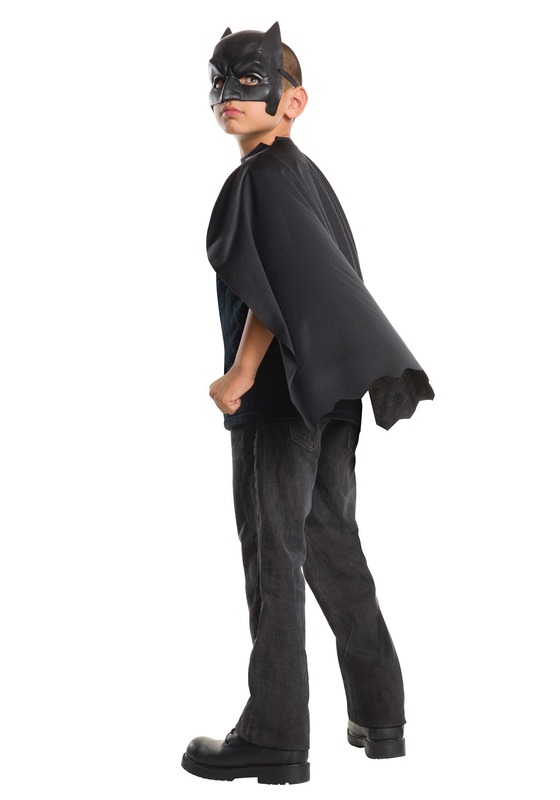 Luckily, we have his cape and mask set ready to go for your young superhero! Based on Zack Snyder's Batman v Superman film, this Dawn of Justice Batman Cape and Mask set comes with the Dark Knight's signature look! With easy-fitting elastic and velcro, your child can change from mild-manner Bruce Wayne, to crime-fighting hero, Batman. Just make sure he's got his batarangs ready for action, because he might just find himself facing off against the Man of Steel when he wears this licensed costume set.